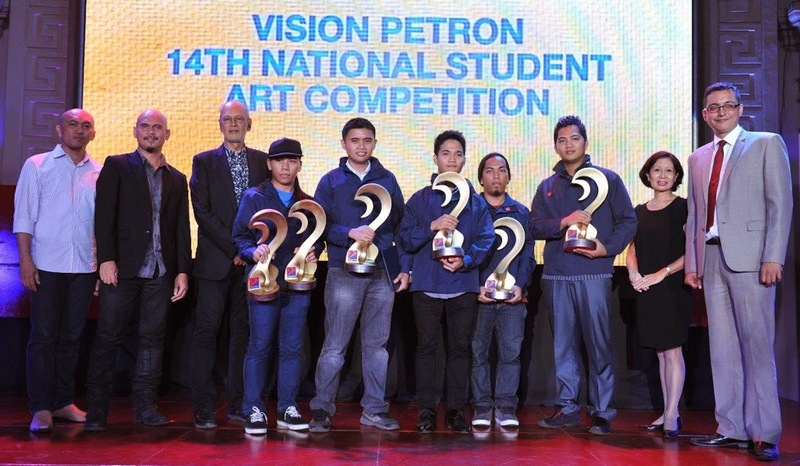 The Vision Petron 2014 National Student Art Competition brought together a rare gathering of veteran and young artists alike at the National Museum, during the awarding ceremonies held last October 9, 2014. The event honored the talented young artists who creatively shared their talents through awe-inspiring masterpieces unexpected at their age. Student artists worked with this year’s theme of Lakbay Panata—My Journey, My Pledge in the creation of a record 2,827 entries submitted for the competition categories, namely: painting (oil/acrylic and water-based media), photography, t-shirt art design, and video-making. Vision Petron 2014 Painting category judges and winners. (L-R): Judges Alfred Esquillo Jr., Orley Ypon, National Artist Benedicto Cabrera; winners Edu Perreras, Karl Albais, Mark Maac, Eric Perreras, Weriel Mallari; judge Felice Sta. Maria, and National Museum Director Jeremy Barns. Acclaimed Filipino artists judged the students’ works in terms of aesthetic quality and also deliberated on which best captured the Lakbay Panata theme. National Artist for the Visual Arts Benedicto Cabrera, or Bencab, chaired the painting panel; veteran photographer Wig Tysmans headed the photography judges; contemporary artist and abstractionist Raul Isidro led the t-shirt art design group; and award-winning actress-director Laurice Guillen oversaw the video-making jury. Taking home the grand prizes in the oil/acrylic painting category were: Fulfilling And Caring For God’s Gift by Edu P. Perreras (Museo ng Angeles); Till Death Do Us Part by Eric P. Perreras (Museo ng Angeles); and Sa Liwanag ng Tagumpay by Mark Leo G. Maac (Bulacan State University). For the water-based painting category, the grand prize winners were: Sa Gitna ng Unos by Weriel B. Mallari (Tarlac State University); Iniukit ng Panata by Edu P. Perreras (Museo ng Angeles); and Bayan Ko, Ipinagdarasal Ko by Karl P. Albais (Xavier Technical Training Center). The photography grand prize winners were: Eid Mubarak! by Ezra L. Acayan (Far Eastern University-Manila); Kabataan, Karunungan, Kalikasan by Titus Ira J. Adayon (John B. Lacson Memorial Foundation Maritime University-Arevalo); Sapa by John Christian D. Guevarra (John B. Lacson Memorial Foundation Maritime University-Arevalo); Untangling the Flag by Jeremiah A. Digo (Adventist University of the Philippines); and Harmony by Reu Dawner A. Flores (Adventist University of the Philippines). The t-shirt art design category was won by: Serbisyong Kapwa Tao Lakbay Ko, Panata Ko by Rosela C. Andal (PUP Lakandayang Cultural Association); Peksman, Mamatay Man by Celine Anne E. Magno (Technological University of the Philippines-Manila); and Panata by Joshua B. Zerda (Far Eastern University-Manila). Finally, the video-making category champions included: Para Sa’yo, Inay by Vyankka Pauline R. Balasabas and Haysonne C. Garol (University of Mindanao); Uling by Hector B. Calma, Roni S. Benaid, and Denise Gail T. Tumibay (PUP Lakandayang Cultural Association); and Hiram by John Henry B. Pantilanan, Carlo M. Donadillo, and Jose Daniel A. Domingo Yan (Polytechnic University of the Philippines-Manila). The winners each received a trophy or plaque designed by National Artist Napoleon V. Abueva, as well as a cash prize and Petron merchandise. The schools of the grand prize winners were also awarded a special prize. The winning entries will be featured in Petron corporate materials, such as wall calendars, desk calendars, planners, and t-shirts, among others. In another first from Vision Petron, the calendars and planners will include QR Codes that can be scanned to view the winning video-making entries. All the winners can also be viewed on the website www.visionpetron.com, and in the Vision Petron Facebook page. Vision Petron is a symbol of Petron Corporation’s commitment towards nurturing the Filipino youth’s skills, as well as preserving and cultivating Philippine art and culture, values and traditions. As a national student art competition, it is open to all talented students enrolled in any regular university or college course, or in tutorial art and photography classes. It is also a venue for filmmakers, musicians, performance artists, art enthusiasts, and all Filipinos to converge and be one through their shared love for Philippine art and culture. Petron believes that everyone has his/her own unique perspective on things and that this uniqueness can be expressed in so many different ways. This is the inspiration behind Vision Petron — the belief that free artistic expression remains intrinsic to nation building.